No one is home at Harris HQ at 2 a.m. Corporate executives were clearly avoiding me and any questions I would have asked them about the potential sale. Our esteemed fellow journalists at The Wall Street Journal have reported that Harris Corp., the Melbourne government contractor, has entertained bids from a couple of heavy-hitters. Citing unnamed sources, of course, our News Corp. buddies in South Brunswick, N.J. (1,076 miles from Melbourne), said the suitors could be Northrop Grumman and General Dynamics. But these companies run the risk of insulting Harris with their $70-per-share bids ($10 billion total): The company was hoping for between $75 and $80. The news of a possible sale first broke earlier this month in The Journal. Harris stock rose 6.2 percent Friday and closed at $65.78 a share, making it one of the superstars on Wall Street. I should get me some of that. It's better than Gannett. 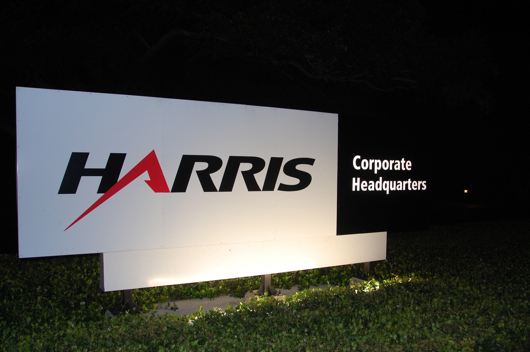 Seeking comment for The Offlede, I went down to Harris' corporate headquarters on Nasa Boulevard earlier. But the campus was dark. Few people were around at 2 a.m.; executives were obviously avoiding The Offlede's tough questions. On Wednesday, Reuters reported that Harris wasn't getting much love at its yard sale. Northrop Grumman and General Dynamics stopped by and said, "Hi," but no one was very serious because the product field Harris offers is too narrow, and U.S. defense spending is about to peak. Some former Harris products are antiquated, such as the publishing system, NewsMaker, left, that I use each night to make newspaper pages. It likely wouldn't sell very well on Craigslist. This arm of Harris was sold years ago, however, so it's not weighing down the company anymore. Just me. 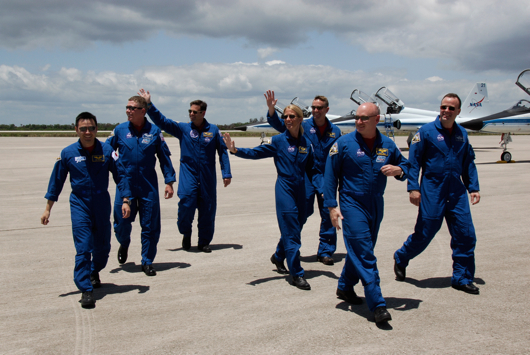 Discovery will launch at 5:02 p.m. Saturday from Kennedy Space Center. But before it goes up, there's an important piece of trivia you should know. The typeface on the shuttle is Helvetica. That's right. NASA has no room for showing off - no flourishes, no serifs. Plain, old-fashion Helvetica. Serifs are obviously not aerodynamic. The choice of Helvetica for the shuttle was not for aesthetic purposes: It was clearly an engineering decision. If NASA went with a serif font - say, Garamond or Georgia (used on The Offlede) - the shuttle wouldn't have the power to make it into orbit. Though unpretentious, Helvetica is an attention-grabber. I used to use it as a headline font for special newspaper layouts. So, it's also obvious that NASA used Helvetica to make sure that, if they're out there, the aliens would see the shuttle. 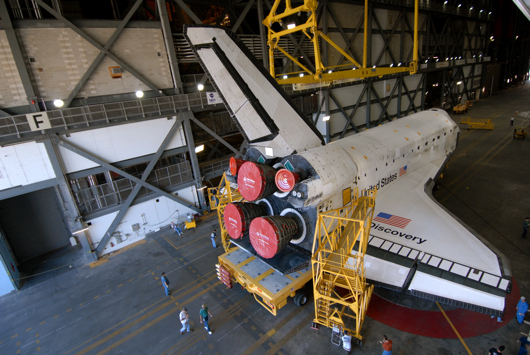 Discovery's liftoff will be the first daylight launch since I got my telephoto lens. Unfortunately, I'll be at work during the launch and will have a distant view of the event. I'll still shoot it, but my 200mm Nikkor isn't powerful enough to pick up the Helvetica all the way from Melbourne. 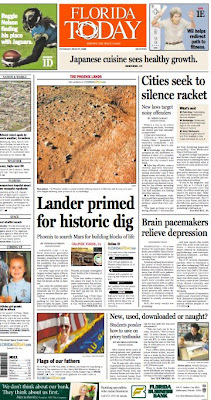 I wanted to note that FLORIDA TODAY's front page about the Phoenix rover's second day on Mars was part of Poynter Online's "Page One Today" feature. It's nice that the newspaper with a local connection (NASA) to the project was chosen to represent such a historic achievement. However, I need to point out a certain sentence of the story. A space team reporter writes, "Its three legs level on the largest lowland region of Mars, NASA's Phoenix spacecraft is eyeing Vastitas Borealis, mottled red terrain as flat as Kansas." After three days of trying, the reporter finally got the cliche "as flat as Kansas" into the newspaper without the copy desk deleting it. Aside from the need to avoid overused expressions in newspaper writing, we should also examine the accuracy of such a statement. Is Kansas really THAT flat? According to a co-worker of mine, no (I've never visited, so I can't judge). If we must compare Mars' state of flatness with an American state, why not use Florida? It is the flattest of the 50, with its highest point of 345 feet at Britton Hill (the lowest highest point of any state). And wouldn't readers in Florida be able to relate better to Florida than to Kansas? Or maybe we should just stick to "flat as a pancake." Or we could take a chance and say, "flatter than a pancake." Most people could understand that even if they hate pancakes. Oh, but wait, it seems that the entire Earth - not just Kansas - is flatter than a pancake. So that - and its French brethren, the crepe - are out. I guess we'll just have to say that the Mars terrain is "flat." No cliche or analogy required. Is that so difficult to grasp? Somehow, I've managed to hold back my urge to rant about journalism stories about gas prices. I have resorted to sarcasm before, though. The master of sarcasm and all things parody got me off the hook. Jon Stewart of "The Daily Show" expressed my own thoughts the best in the above piece, so I don't have to. Take a look. For some reason, I was a bit confused as to how a certain feature on my Nikon D40 worked. My father straightened me out. It's an embarrassingly simple function that's not unique to digital SLRs, so I'll stop short of divulging the exact nature of my ignorance. But I got past it, and I'm looking for new things to photograph. It's Florida, and I know there are animals, waves and probably a few insects to shoot here, so I need to get out and explore. Somehow, I must muster the ambition. 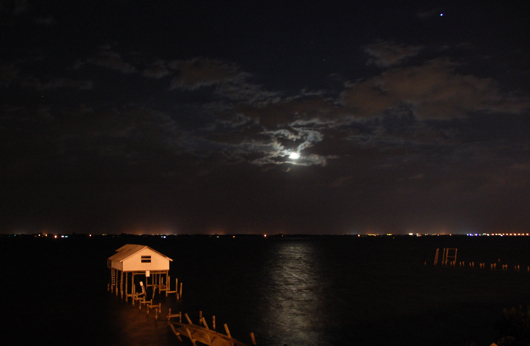 A few nights ago, I was driving home along the Indian River in Palm Shores ("the little town that cares") when I noticed the strange reddish hue of the moon shrouded in mist and low-level clouds. Coincidentally, there was leftover lightning in the air after a strong storm ripped through the area. My objective was to get the moon and the lightning in one shot. And it wasn't raining, limiting the danger to my camera. Unfortunately, the lightning stopped when I got my tripod set. But I saw a neat boathouse on the river that I thought would look good in a photo. But not that night: The moon went behind the clouds before I had a chance. I returned to the spot last night and took this 3-second exposure. No lightning, no reddish hues, but oh well. 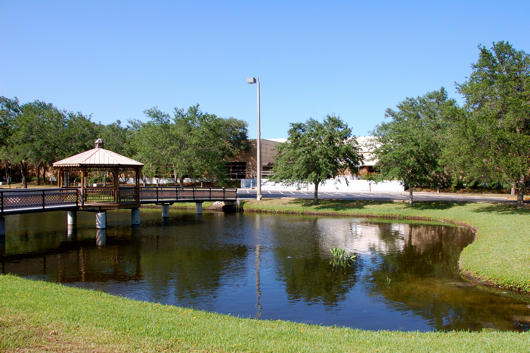 It doesn't take long for Florida weather to replenish what it took away during the dry season. After some wicked thunderstorms this weekend, retention ponds (the true essence of beauty in Florida) are again full to the brim. This particular puddle graces the backyard of FLORIDA TODAY. A little Memorial Day swim, anyone? The color contrast in the photos also illustrates the value of an ultraviolet filter, which I purchased this week for a hefty 10 bucks at Best Buy. This is 423 Mimosa St. SW. The home was valued at $160,000. At many of these homes, there were advertisements of some sort - such as business cards and a large banner in this photo - for housing contractors and fire insurance. I'm sure there are several that are still missing from the list. Estimates are that 40 single-family houses and two mobile homes were destroyed. I found two others that were not on the list of 33, bringing the total to 35 Palm Bay homes on my map. 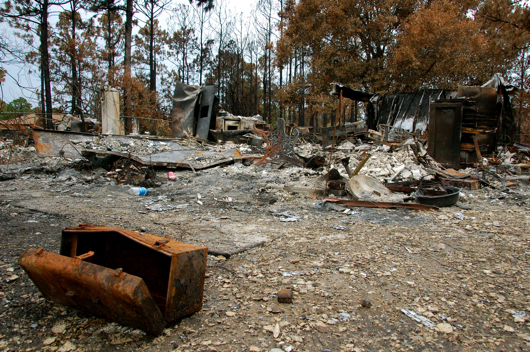 I've also included two destroyed homes in Malabar. So that's 37 so far. 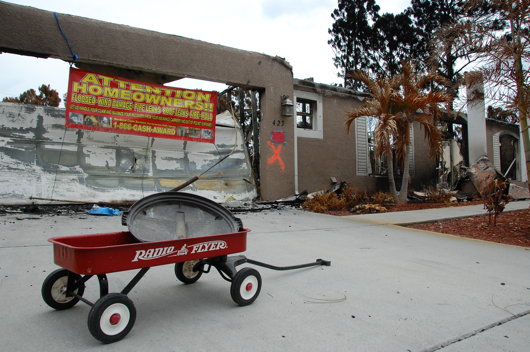 No matter the specifics, it's sobering to drive around Palm Bay and see so many homes reduced to rubble. At many sites, the most recognizable remaining feature was the utility room, where a washer, dryer and sometimes a water heater were more prominent than the rest of the flattened home. I've included shots of some of them in this post. For the others, again, go to the map. This flier at 213 Gaspar St. SW, where a home valued at $180,000 burned, is from builder Stanley Homes. This home at 1072 Westport St. SE, which was valued at $160,000, has a lot of outdoor equipment in the front yard, such as a grill and a canoe. A bike burned at 1484 Summer St. SE, where a $130,000 home was destroyed. 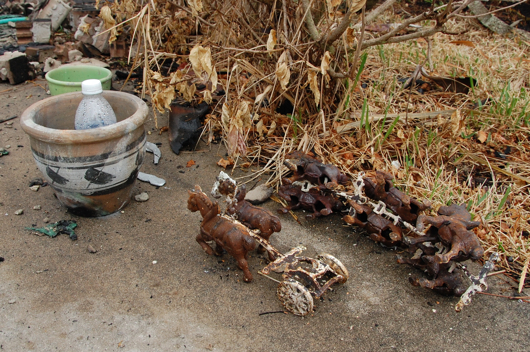 Horse ornaments also burned at 1484 Summer, but they're still recognizable. It's amazing how certain things survive. A Jeep was destroyed at 1726 Gould Ave. SW, where there was a $180,000 house. The $180,000 home next door at 1728 Gould also was ruined. A Red Cross business card was taped to the fence in front of a former $160,000 home at 3015 Flagstaff Ave. SE. A toolbox rests in front of the rubble at 3196 Wessel Ave. SE, where a $200,000 home burned. 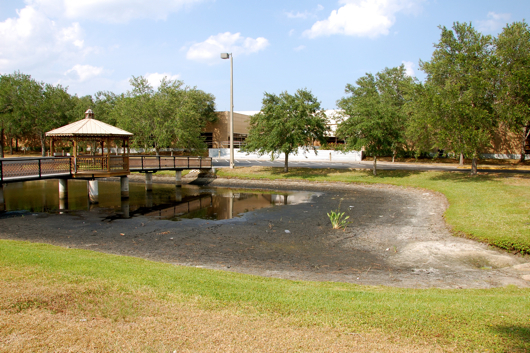 It won't be too long before the employees at FLORIDA TODAY won't have any turtles to feed bread because the pond water is disappearing quickly. Less to keep themselves occupied during their smoking breaks: bummer. 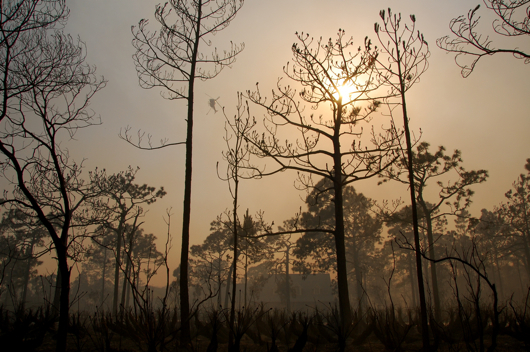 The wildfires are nearly extinguished here in Brevard County, but Florida isn't out of the woods yet. As you can see from this photo, it's still dry. 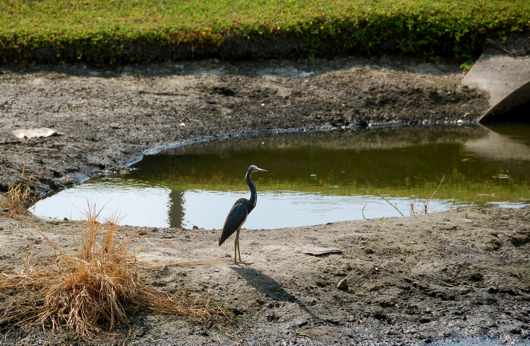 The bird is standing on the bed of a pond behind FLORIDA TODAY, and it probably should have water above its head. The usual water level is at the grass you see in the background. I thought that when the pond drained, there would be an alligator slopping around in the mud. No such luck. I still haven't seen a gator since moving to the great Sunshine State. 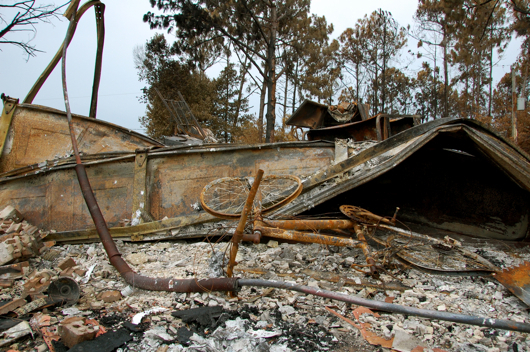 The final totals aren't in yet, but 42 homes were destroyed in the fires. You should go to my map on floridatoday.com to see the extent of the damage. The map has received about 7,000 hits (my most-visited online creation yet). My next project will be to gather addresses of all homes destroyed and enter them onto the map. I was going to get the addresses myself, but the FLORIDA TODAY metro staff is working to get them instead, according to sources familiar with the situation. My roommate says the woods behind my home is more of a marshland, so there's less likelihood of it burning. But if the arid pond is any indication, a marsh probably doesn't work an incredible amount in my favor. Executive Editor Terry Eberle wrote about the scene in the newsroom last week. I should add that the copy editors at FLORIDA TODAY did an excellent job of handling the late-breaking news copy. It's tough to handle such an increased editing and design load with normal staffing levels and deadlines. 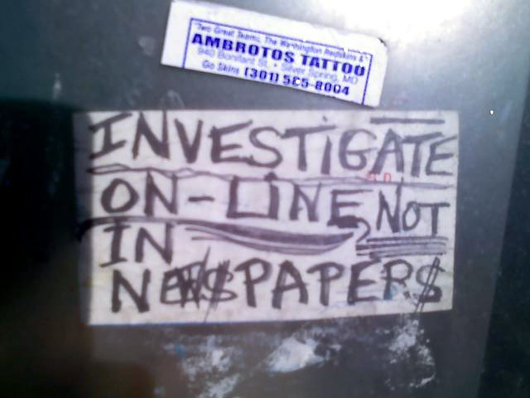 And when you're covering a local story that becomes national, the greatest concern should be quality. I took a little trip around the county to chronicle the destruction. Use the pointer to navigate around the map. Click a blue marker to view photos of the destruction at that location. Use the scrollbar in each window if necessary. When done with each window, simply click off and move to another marker. Update: This map is being changed because FLORIDA TODAY is using it. I still don't have that nice video camera, but this is better than nothing. This fire on Babcock Street was near two gas stations, but firefighters had it mostly contained. I was wondering why I smelled smoke when I returned Monday evening. 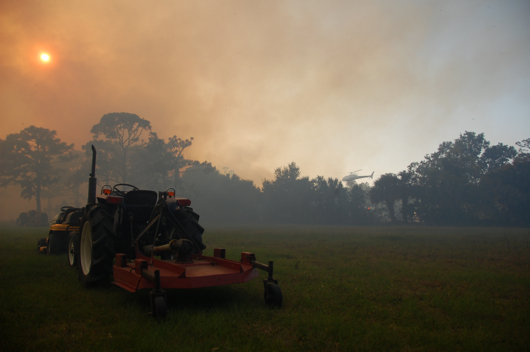 A small brush fire ignited near my house sometime in the afternoon while I was gallivanting in South Brevard. Because my roommate isn't home right now, I feel responsible for the house. But it's a good thing our dear Melbourne firefighters were able to quickly knock down the flames. I went back out Monday evening, and there was a fire burning next to Babcock Street that hadn't been there earlier in the day. I used a timed exposure to get the streaks from the passing vehicles in the shot. I hope whoever is starting these things thinks twice about the next one. Firefighters couldn't be everywhere. 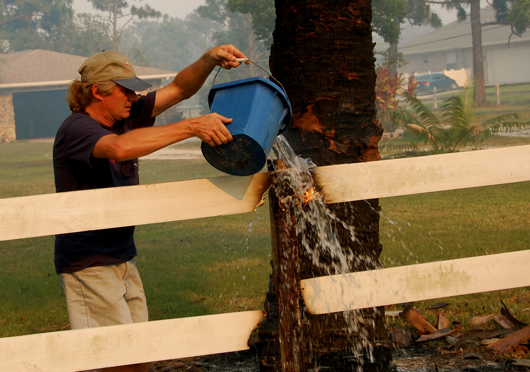 So this Corey Road resident watered down his burning fence with a bucket. 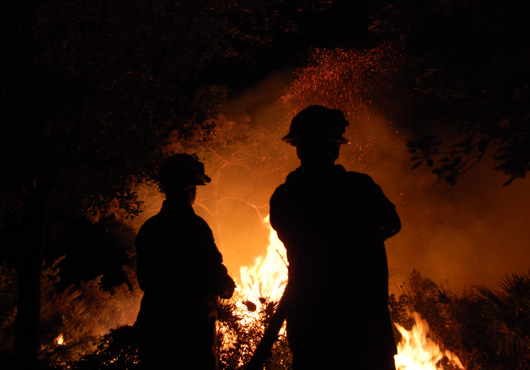 Firefighters stand by in case of flare-ups. When there was one, they put it out within minutes. Tragedies bring communities together. Today, Brevard County came together. 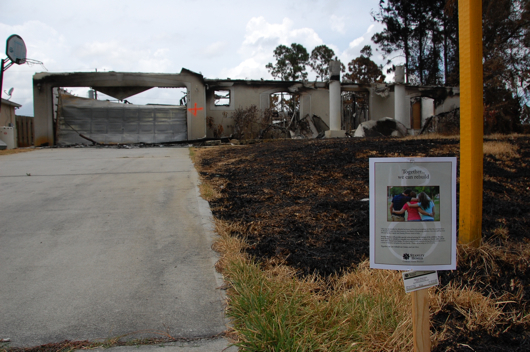 Wildfires have damaged or destroyed 51 homes in the southern part of the county. But the residents are resilient, hardy and stubborn. 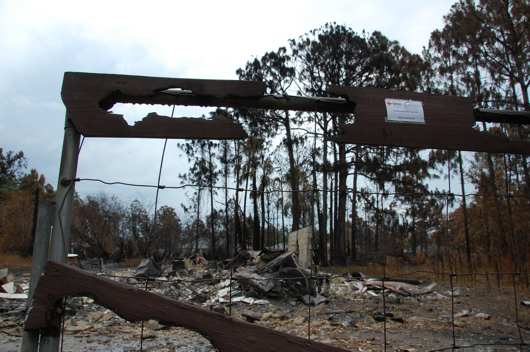 I went to Corey Road in Malabar, where a fire destroyed two homes last night. I didn't get as close to the fires as I did last time, but I snapped a few photos anyway. When I arrived, a helicopter, above, was racing from a pond to the main blaze as it threatened a home with a pile of tires in the backyard. Many residents said they have been afraid for a long time that the highly combustible material would put their homes in danger. But the firefighters didn't let that happen. One large home on the 2000 block of Corey Road was surrounded by fire this afternoon. A man drove by on a bicycle as I photographed it. 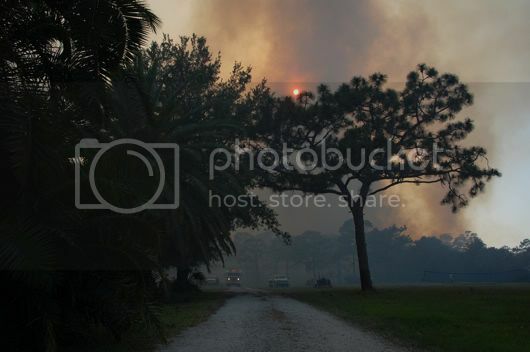 "There was brush all around that huge house this afternoon. 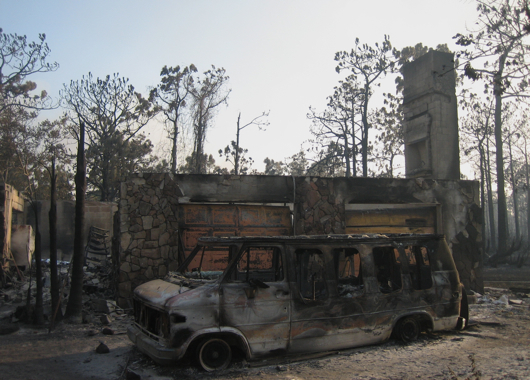 Now, it's all burned, but the home is still there," he said. "That guy was lucky." The land around the home was scorched, but the house stood firm, above. Others were not as fortunate. On the 3000 block, a fireman's home and his vehicles were untouched. Next door, only the charred concrete walls of a house were left. A gutted van, above, and car sat in the driveway. My camera malfunctioned, and I was walking back toward my car when a woman in a sport utility vehicle stopped and asked where I was parked. Her name was Barbara, and her SUV was full of her and her husband's belongings. She wanted get the SUV away from her house and the fire, then she wanted me to give her a ride back to her home. "It wouldn't make sense to pack up to evacuate and then leave the car in the driveway," Barbara said. "My husband's back there spraying everything with the hose. He's a dumbass." Barbara was especially worried because her house is "severely underinsured." "You can blame that on the hurricanes," she said. I dropped her off at the intersection near her home. The rest of the road was closed. I saw others like Barbara. They filled open-air trailers with luggage. They were ready to leave if the wind shifted. I saw residents wearing masks as they drove by me. Tears were rolling down their faces. Megan O'Brien of Corey Road in Malabar is flanked by two neighbors. There's an old garage off to the left of this picture that was damaged. I asked O'Brien about it, and she said it was hit during the 2004 hurricanes, not during the 2008 wildfires. After I fixed my camera, I walked back toward Barbara's house. I met one of her neighbors, Megan O'Brien. 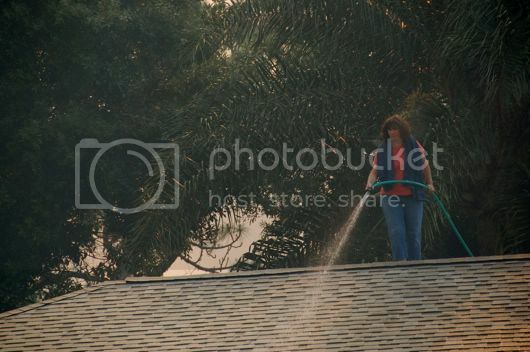 She was climbing down off her house after watering the roof. "I've been up there since noon," she said. 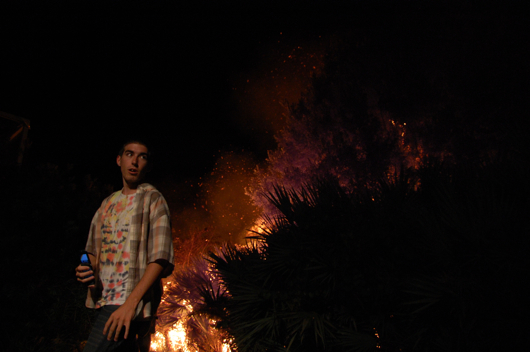 A palm tree burst into flames after I finished talking with O'Brien. 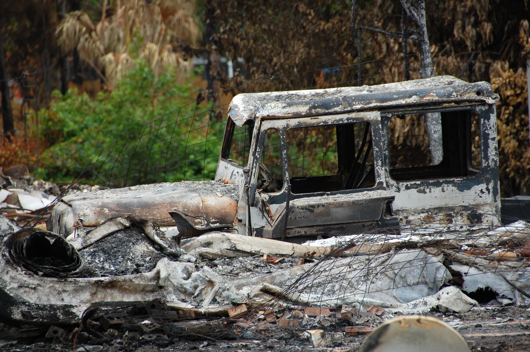 A volunteer firefighting truck raced 100 yards to extinguish it within a minute. 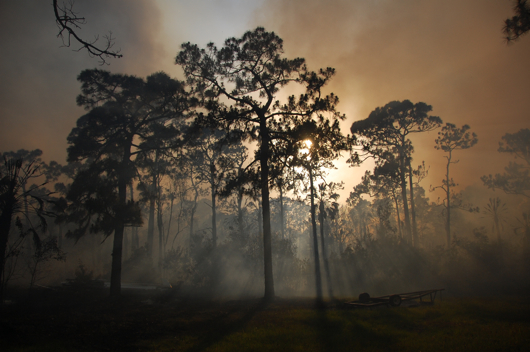 As the sun began to set, the fire and smoke didn't let up. I had been wandering Corey Road for hours. My clothes smelled of smoke. My face was dotted with ash. My sunglasses were coated with a gray film. The smoke was bothering my eyes and nose so much that I had to leave. But since I had arrived, the routes I took to Corey Road had been cut off. U.S. 1 was closed. Interstate 95 was eerily empty, above. All the major north-south routes were blocked. I drove to an I-95 overpass in Malabar, where I had a 360-degree view of the situation. Plumes of smoke rose from at least five regions. Fire was everywhere. Considering the size of the blazes - more than 3,000 acres have burned - it's amazing that hundreds of homes haven't been destroyed. Today would be a good day to appreciate our county and its public servants. The rays of sun shining through the smoke are strangely beautiful. This is in front of Megan O'Brien's home. 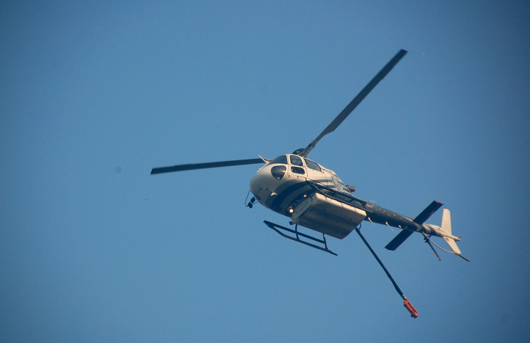 In the background, a chopper dumps water on a tire fire. The hectic night at FLORIDA TODAY is over. Now, it's a hectic day. 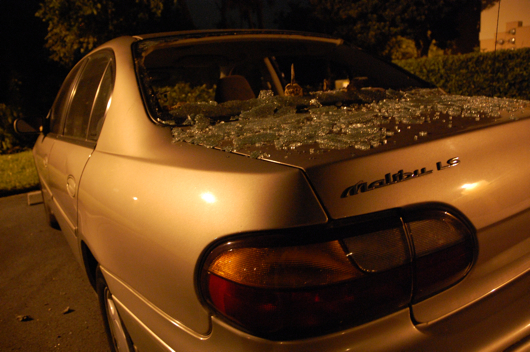 The winds that whipped a tree into Beth's car, above, are whipping up some serious brush fires across Brevard County. More than 2,000 acres have burned in several separate blazes countywide. Click here and here for photos. Unfortunately, the authorities won't let nonresidents near the fires, so my aspirations to shoot a blaze or two have fizzled out. Instead, I've resorted to using photos of Beth's unfortunate incident to illustrate the windy conditions. I live next to brushy area, so I have my fingers crossed and am keeping my eyes out for arsonists. 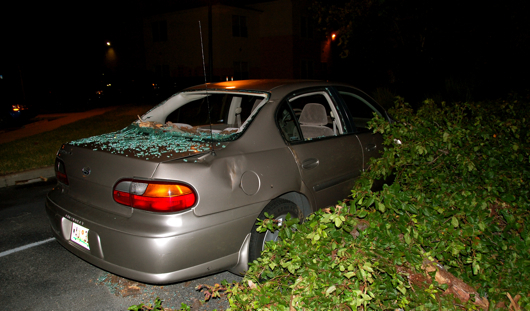 This is co-worker Beth's car after a tree had its way with it. Some tough luck there. Sorry, Beth. 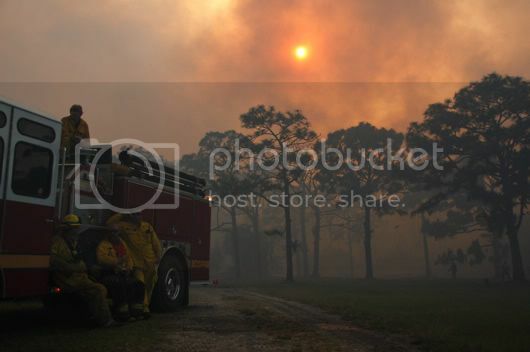 The wind also is blowing flames around Florida. 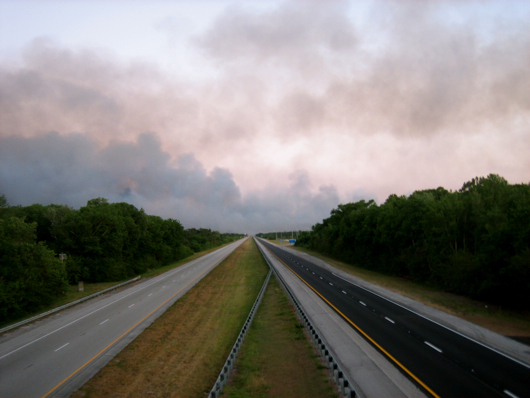 Interstate 95 in Brevard County is closed because of smoke. It's going to be a long night at FLORIDA TODAY. This one is from the archives. These words were stuck to a Washington Post newspaper box last summer at the Tenleytown Metro stop in Northwest D.C. I laughed, then snapped a shot with my phone. Graffiti on dilapidated buildings supposedly illustrates the frustrations of nostalgic street wanderers. But the words stuck to this old-fashion distribution method show the frustrations of a new news-consuming public. 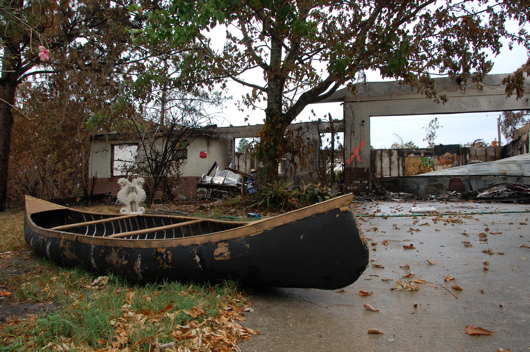 In December, more than two years after Hurricane Katrina, I took a trip to New Orleans to explore the area. I wrote about it in a series called Assignment NOLA. I would recommend this post. I took some poor-quality videos, but I never had the ability to edit them. With the new Mac, I finally got to compile them into a somewhat coherent video recap of my time in the city. I'm eagerly awaiting a real video camera so I can get serious with Final Cut. Blogger's note: Again, forgive me for the stupid look on the first frame. I need to fix that. I was briefly dumbfounded as to why the unique visitors on The Offlede suddenly jumped. Then I saw that City Room, a blog of The New York Times, had linked to my posts about -30-. Go here for the City Room post. It was Bob Basler of Reuters who gave me the idea to investigate the big screen version of -30-, "-30-." Who would have known that a number could be such a popular topic? Unfortunately, the entry about The Offlede was the last item of City Room's post. But honestly, what can I expect for a post about -30-? More journalism educators should blog. Professionals, professors and students could learn a lot from blogs by j-school insiders. Two of the foremost blogging professors are Doug Fisher of the University of South Carolina and Andy Bechtel, left, of the University of North Carolina in Chapel Hill. I'm especially eager to see what Bechtel writes about his upcoming summer as an intern at the Los Angeles Times. That's right: a 40-year-old intern. (It's nice to have connections.) Go here for more. Yesterday, Bechtel became the second of the aforementioned j-profs to mention The Offlede's work at the American Copy Editors Society conference in Denver. For the sake of gratitude and cross-promotion, here's a link to that post, which links to my Smokin' ACES home page. He gave me "The Last Word from Denver." 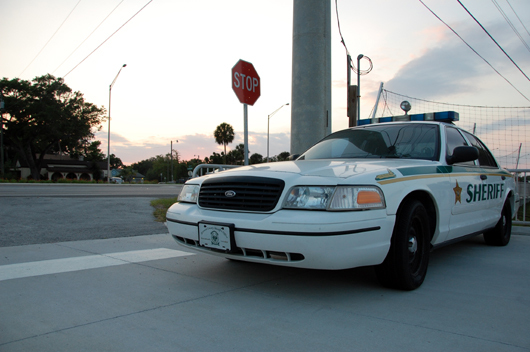 The empty cruiser is located at the entrance of a pier on the Indian River along U.S. 1, near Pineda Causeway. FLORIDA TODAY is doing its annual "Speed Patrol" in which reporters and photographers shoot drivers first with a radar gun, then with a camera if the speeding infraction is egregious enough. That got me thinking about a police car I see every day while driving to work. For as long as I've been a Florida resident, a police cruiser has sat empty in a rest area along U.S. 1, near Pineda Causeway. It's located on a corner, so by the time drivers see it, it would be too late: If they are speeding, they'll surely be caught. But because the cruiser is unmanned, it does nothing more than cause a moment of panic, then sweat running down the driver's forehead, then pure elation when the car doesn't pull out to chase the driver for doing 40 mph over the speed limit. But the Brevard County Sheriff's Office has gotten a bit sneaky. Occasionally, deputies will plant themselves a half-mile down the road from the empty cruiser. So, thinking they're in the clear, people speed up after passing the empty car, then they see the manned vehicles. I'm a sucker, though: I tend to speed by the first cruiser, knowing it's a phony, then go a bit too fast past the real ones, too. It's only a matter of time before they get me. I suspect the sheriff's office is aware of this and has caught many speeders who think they are sailing smoothly, unwatched. So be careful out there, Brevardians. And slow down whenever you see a police car - even if it's empty. Here's what the back cover of the "-30" VHS says, in part: "In -30-, newshounds race against the clock to fill the empty pages with stories that will become as much a part of America's morning as a cup of coffee. 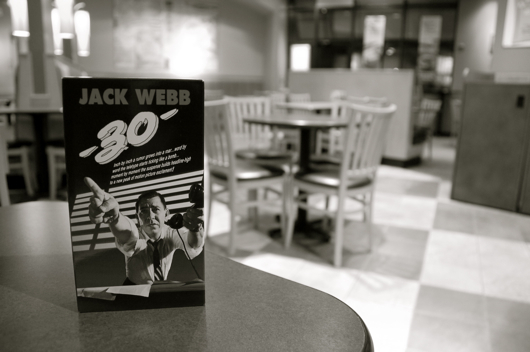 (Jack) Webb leads the way, playing a night editor of a big-city paper. ... From 3 PM till midnight, they'll ride the adrenaline rush of dramas that shape the world and their own lives. Come next day, they'll gladly do it again. -30-"
Update: The New York Times bloggers have linked to this account. Go here for their post. Bob Basler, blogger over at Reuter's Oddly Enough, noticed my post about "-30-," the former sign-off code for wire copy. He sent me an e-mail, which first thanked me for linking to his blog of "news, but not the serious kind." "I enjoy your blog, though it's a little depressing to see -30- described as an 'old-fashion journalism tool,'" said Basler, left. "I don't dispute the description at all, but it's still depressing." Basler has been with Reuters for about 30 years and was around when wire services actually used the code. It seems that young journalists are hardly aware of it. Fortunately, I care about history. In a follow-up message, Basler made a suggestion. "Some evening you should get really drunk and watch the worst newspaper movie ever, a Jack Webb drama called - 30 -," Basler said. "He plays the managing editor, if you can imagine." Excluding the drinking portion, I decided to follow through with his recommendation. But where to find such an obscure film? Of course, Amazon came through. For $6.63 plus $4.98 shipping and handling ($11.61), the "almost new" VHS was mine. Fortunately, I still have a VCR. It's 97 minutes, in black and white and was released in 1959. The film's action is confined to the newsroom. From 3 p.m. to midnight, editors bicker, laugh and cry in the process of trying to get the paper to press. They subsist on cigars, cigarettes and coffee, and derive entertainment from yelling at copy boys. "Boyyyyyaaa," the editors shout to get their attention. It's a slow night at first: It's raining, and the best possibility for the lede photo is of a young hotty, whose likeness is peddled by a journalist-turned-modeling-agent who left newspapers for a better-paying job. The model is played by 1959's Miss Arkansas, Donna Sue Needham. The movie doesn't say whether the photo made the cut. When a story about a missing 3-year-old girl breaks, that's when the central conflict of personal versus professional life revs into action. The plot attempts to romanticize the world of editors, which is a tall task. 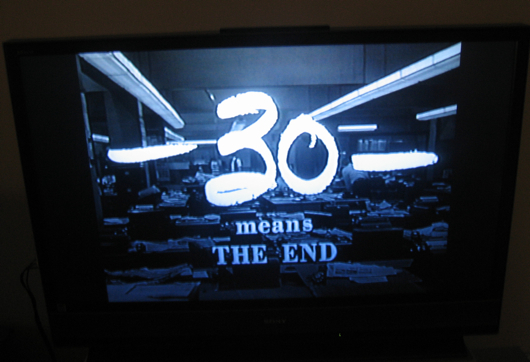 To achieve that, "-30" weaves an external plot line into the journalistic action. Webb, who plays managing night editor Sam Gatlin, deflects his wife's wish to adopt a child. He's afraid he'll become too attached to the boy, just as he has become too attached to the story of the missing girl. Complaints about the shift. "I've been feeling sorry for myself, because working nights, I have to miss some of those real good TV comedy shows," one editor says. Inter-newsroom romance. "There isn't a man on this newspaper who could have gotten halfway to first base with me," stenographer Lady Wilson says. A slow news day. "Anything interesting on the wires?" Gatlin asks the wire editor. "If you think the national spelling bee in Philadelphia is interesting," the visor-wearing wire editor says. Distractions in the newsroom. The film periodically cuts to Carl Thompson, who is taking a couple on a tour of the building. One tour stop is in the art department, where an "artist" complains that all he does is retouch photos instead of doing real art. Propensity to put animals on the front page, specifically whooping cranes. "Do you know how many letters we got on the last story on them?" Gatlin says when his staff objects to the photo. "I do know that not one of them buys a paper," metro editor Jim Bathgate says about the birds. Annoying callers. A reader known only as Mrs. Burgess calls to ask about the crossword puzzle. "I do not know what 51 down is, and I am not being suspiciously evasive," Gatlin says. Later on, Mrs. Burgess calls the wire editor to get the phone number of the puzzle editor. Then, toward the end, she calls again. This time, Bathgate answers. "The word is concur," Bathgate says as Gatlin overhears, seemingly surprised that Bathgate knows the answer. "Yes. C-O-N-C-U-R. Concur." Humbleness. "We're not heroes in this business," Bathgate says. "We just write about the heroes." Arrogance, when Gatlin talks about whether God exists. "What would be so tough about being a power that’s greater than we are?" he says. An odd character, which reminds me of a FLORIDA TODAY co-worker. Bathgate is obsessed with keeping track of a certain actress and has a copy boy give him hourly updates. "She had creamed tuna fish for supper, then her boyfriend came over and gave her a pedicure," the copy boy says. Those elements of newsroom life are intertwined with the main plot: the missing girl. A new star metro reporter finds out that the child fell into an uncovered storm drain during a bad rainstorm. Gatlin decides to run a 16-column, double-truck photo of the drain. Gatlin's concern for the missing girl stems from the loss of his own wife and child in a car accident. With his current wife, the question of whether to adopt a boy weighs on him, along with the fear that the missing girl has died. The serious plot line is lightened by the cheesy, sort of Hawaiian music, which includes bongo drums. It's a stretch considering where the story is set: Los Angeles. And the film hardly lives up to the print on the front cover of the VHS: "Moment by moment the suspense builds headline-high to a new peak of motion picture excitement!" I won't divulge the ending in case you want to seek this film out for yourself, though I can say it's pretty cliche. But Bob Basler was right. "-30" is the worst newspaper movie ever, or at least, it's the worst I have seen. To best critique this film, I'll quote a Nov. 12, 1959 New York Times review: "Mr. Webb has used for his title the traditional newsman's sign-off symbol. But his picture, crammed with so much smart-alec nonsense, is rarely as authentic." Blogger's note: Basler also is the proprietor of The Good, the Bad & the Ugly, where we journalists "hang out our dirty laundry, debate the language, showcase reader criticism of our coverage," Basler said. I shot this video using my Canon point-and-shoot digital camera, so again, the quality of sound and picture just isn't there. At least I finally mastered video exporting in Final Cut. My videos can only get better after this. I used Viddler for this one because it allows larger files than YouTube. But if you want to see the YouTube version, go here. Oh, and if I knew how to change that stupid look on the preview frame, I would. I edited this quickly in Final Cut Express, so it's not awesome. I can't for the life of me figure out how to export a Quicktime file without overly compressing it or not compressing it enough. This file is only about 6 megabytes, so the quality isn't awesome. But at least it shows a little of the scene of the fire this morning. Update: I boosted the quality and uploaded the video to Viddler, instead of YouTube. 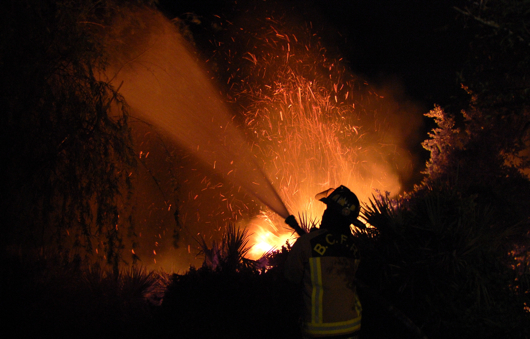 Firefighters spray water at the fire, above, and at the trees on someone's lawn, below. Update: My employer linked to my Floridatoday.com blog from the home page. The Offlede is going mainstream. Uh oh. They also made a photo gallery with my shots. 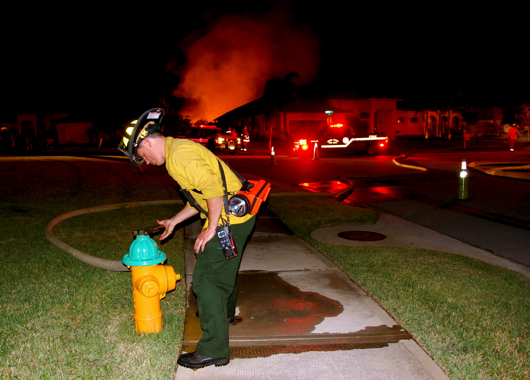 When I got out of work around 1 a.m., I heard that a fire had burned 60 acres in Viera. It sounded like a good photo op, so I set out to chase down some flashy lights and orange glows. Driving along Murrell Road, I saw several TV crews doing pretty little standups with the orange sky silhouetting the homes in the distance. So I knew Murrell Road wasn't where the real action was. As usual, the TV guys were miles from the scene. They dared not get their feet wet. So, I found my way to Starling Way, a little street in a large subdivision with expansive, expensive homes. 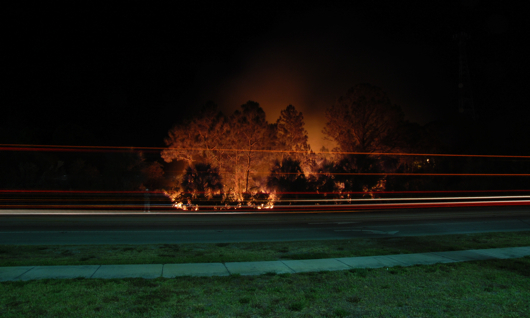 The fire was burning the pines, palms and palmettos just feet from the buildings. Poor trees. Then, I got my feet wet. A sprinkler came on as I walked by one house. It soaked my pants, my socks and my shoes. But I didn't care. I snapped photos like crazy and forgot about it. The heat from the fire dried my clothes anyway. 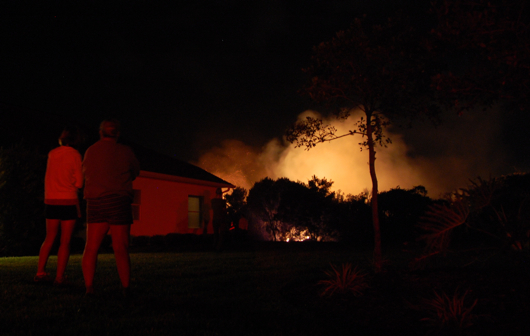 A group of about 10 youngish-looking individuals were watching the flames behind the homes. Some said they live in the area. Others were the residents' friends who just came to watch a good show. But apparently, someone forgot the marshmallows. Or do they just not do that here in Florida? Does anybody know about s'mores? 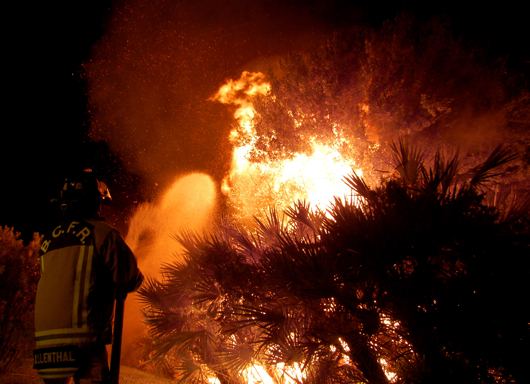 The firefighters stood around and watched as the flames shot 30 feet into the air. 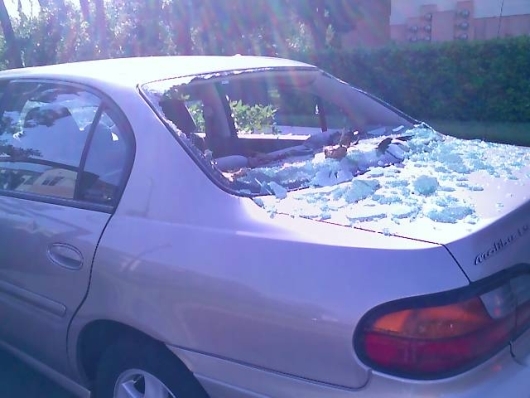 They occasionally soaked a tree on someone's lawn or the screening around several of the homes' covered patios. 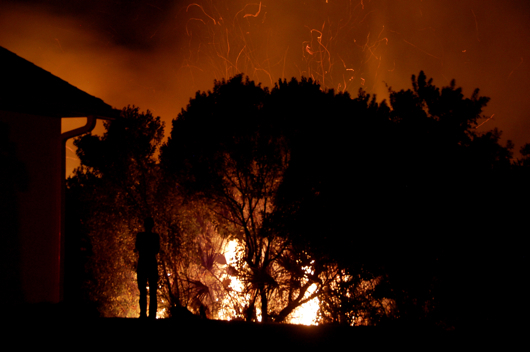 Luckily, the wind was blowing the fire away from the homes and into land that had already burned: It had nowhere to go. The fire burned southward behind the homes lining Starling Way. It probably burned 400 yards in the few hours I was there. 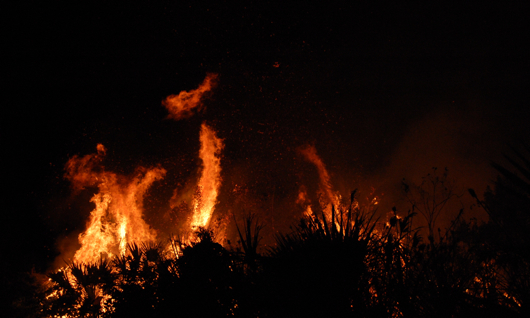 When it reached a pond, the men stood between the blaze and the marshy area. They spritzed it a few times with their mighty hose. 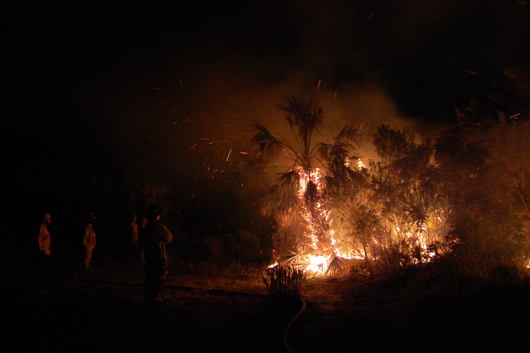 A large stand of palms and palmettos crackled into flames. It reminded me of that bonfire I went to a few years ago when the Red Sox won the World Series. But that was all. 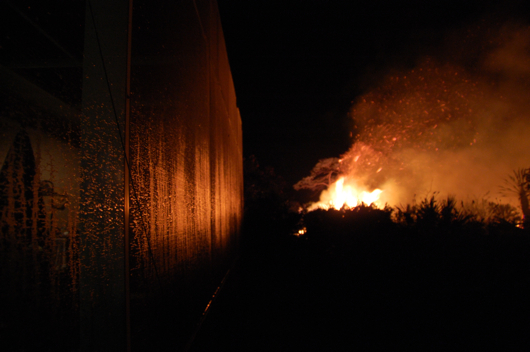 Around 3:15 a.m., there were only small flames, and the firefighters were ready to ship out. The owner of the house closest to where the fire stopped was grateful. "I'm so glad it didn't go any farther," he said. "We have a beautiful view of the pond, and I wouldn't want the fire to ruin it." "Thank you, guys," he said to the firefighters. "Oh, no problem," one firefighter said. "That was easy." I took 858 photos, or 1.73 gigabytes of disk space on my new Mac. Looks like an external hard drive is in my future. I'll post video later. I should get sleep first, though. My first shot when I arrived. This is where I started to get my feet wet. A couple of concerned residents near one of the more modest homes of the neighborhood. The flames were only feet away, but the wind was blowing them away from the homes. People, including myself, got close enough to roast a few marshmallows. It was quite safe because of the wind. 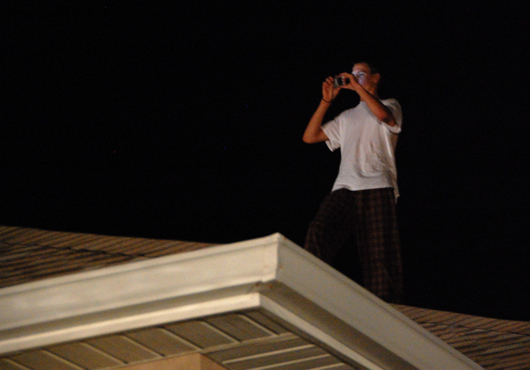 One of the younger residents climbed onto his roof to snap a photo. He probably got better shots up there than I did on earth. One of the less modest homes here. Just after I shot this, the flame flared up two houses down the street, threatening a house. These people scattered when that happened. Firefighters hosed down the screens of this house's patio area. Nope. Not hell. Firefighters don't go there. Viera, you're off the hook. 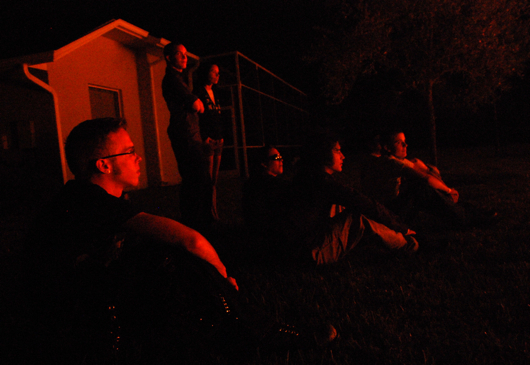 The fire brought together a bunch of teens from the neighborhood. Some good, clean Thursday night entertainment! I was talking with a homeowner in the area, and she asked what caused the fire. 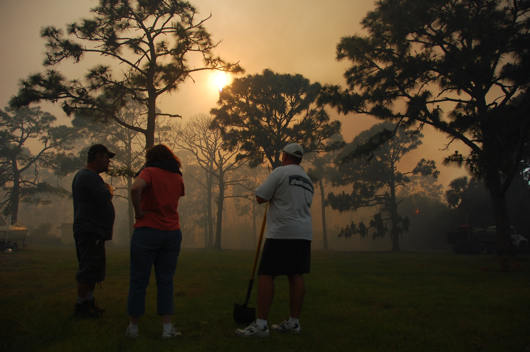 I didn't know, and then one of these guys said that teens had set the recent brush fires in Brevard County. He said he had no part in any of them, though. I think the teens had more fun taking photos of the fire than I did. This one used his cell phone. 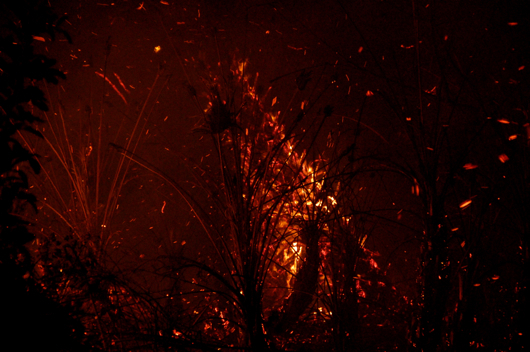 The burning carcass of a palm tree. RIP. ... Not. This was the firefighters' last stand. Once this palm was dead, it was done. Good night.